Granite Peak, highpoint of Montana. 2016. On Tuesday, August 9th 2016 I summited my first big western highpoint: Granite Peak, Montana. 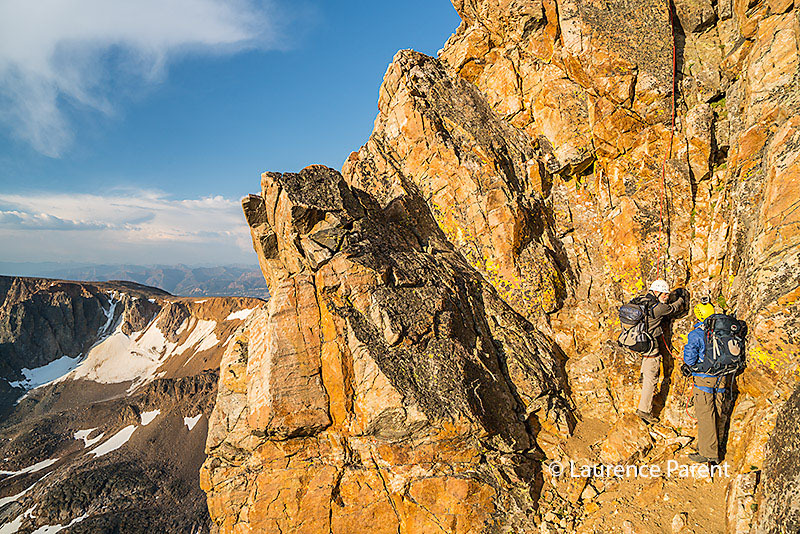 It is one of a dozen states in the western U.S. whose highpoint has one or more of the following: remote access, long approach hike, high altitude, and lots of elevation gain. 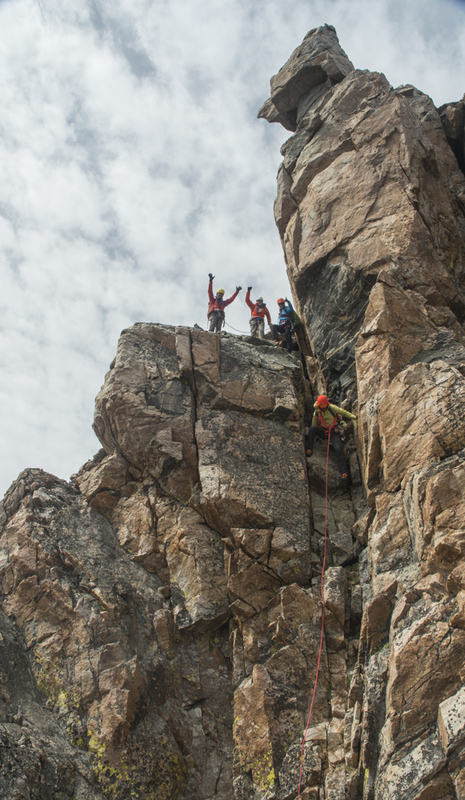 Granite happens to have all those features, along with technical rock climbing just for good measure. 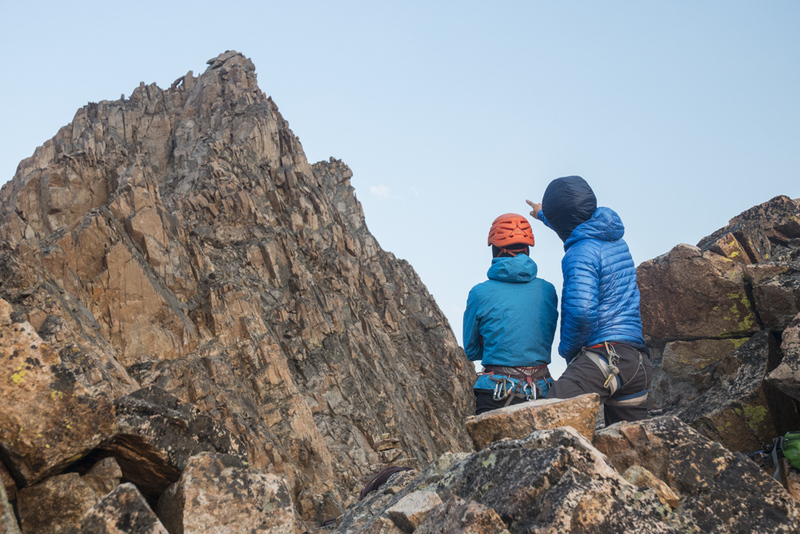 It is generally considered the second hardest highpoint after Denali (depending on who you ask). I first started thinking about Granite Peak at the 2014 Tennessee highpointers convention. That was when it was voted as the sight of the 2016 convention. I knew I would have to get in shape and do some training for this one. Starting in the winter of 2015-2016 I made a point to start training. I got out hiking and snowshoeing when I could, regardless of how cold it got. In January of 2016 I joined an indoor rock climbing gym to get prepared for the technical rock climbing portion of the hike. After spending Friday night in Yellowstone National Park, I drove to Sunlight Sports on the main street in Cody, Wyoming. Here, I met the Kenny, the manager of Jackson Hole Mountain Guides and the other climbers that I would be spending the next few days with. Nadav would be our lead guide and my fellow climbers were Roger, Laurence, Marc, Al, and Chris. Today's main objectives were to do a gear check and to do some climbing outside of town to test everyone's ability. Once we had all been introduced and gotten an overview of the next couple of days we headed west of town a little bit where there was a popular rock climbing spot just off the road. Since the last section of the hike was technical, the guides wanted to make sure everyone was comfortable with the ropes, harnesses, and techniques we would be using. While I was use to the climbing part, and had a handful of experiences with top roping, one technique that was new to me was short roping. 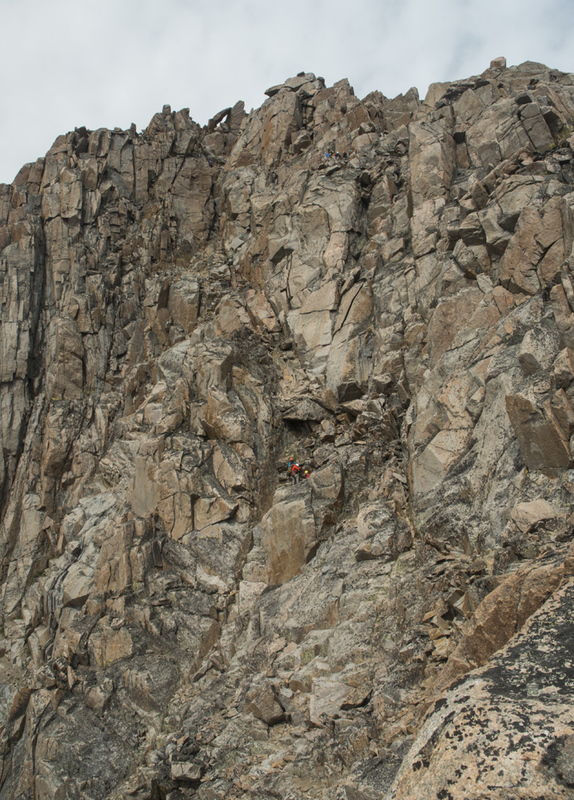 This is where a guide is at one end of a rope while two climbers are at the other end with only about six or seven feet of rope between them. The idea is that the guide climbs a pitch first, secures the rope at the top, then belays the two climbers as they make their way up. I passed this part with flying colors. I've always loved climbing stuff and going to the rock wall really refined that skill set. Back in town we met up at Sunlight Sport for our gear check. The guides want to make sure we had everything we would need to stay safe and warm over the next couple of days. Unfortunately my gear was a little lacking. Nadav suggested three things; an extra top layer such as a fleece jacket, a warmer sleeping bag, and a different head lamp. My sleeping bag was only a 40 degree bag and Nadav said I would need at least a 20 degree bag. 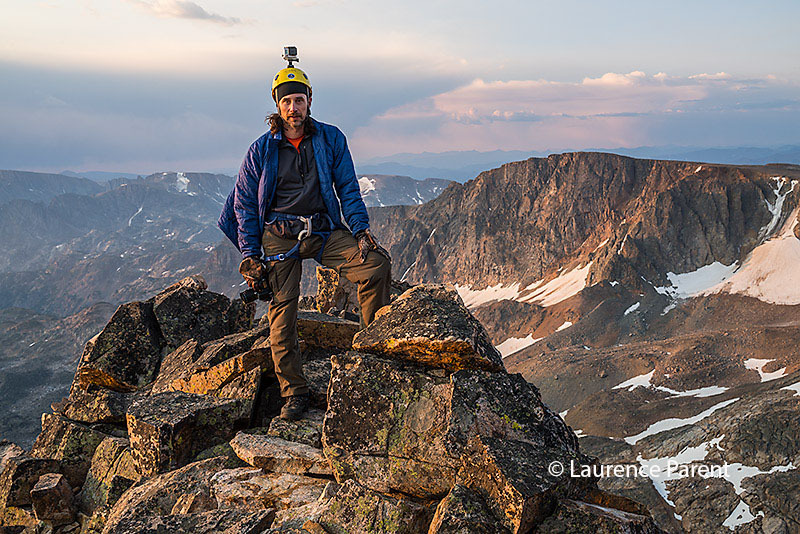 The headlamp I brought with me was designed to clip onto the brim of a baseball cap, not a climbing helmet. I needed one with an elastic band. And the fleece was just for added warmth in addition to the layers I already brought. I would also need a pair of warm gloves. So between Sunlight Sport and the Sierra Trading Post down the street I found everything I needed. I was hoping to get a down bag since it would be lighter and more compact, but they are a lot more expensive. I went with a synthetic bag, which just barely fit in the bottom of my pack. It was weird to be preparing for such cold temperatures since Cody, WY in the middle of August was absolutely sweltering hot, but I trusted the advice that Nadav had given me. That's why I hired a guide. I had never done anything like this before. With everything all set I headed up to Red Lodge, MT to the hostel I would be staying at for the night. I would be meeting up with the other climbers in the morning to drive up to the trailhead. After joining Roger, Al, and Chris for breakfast in town, we met up with Laurence and Marc to start the drive to the trailhead, over an hour away. Half the drive was on dirt roads, but the scenery was amazing. We soon arrived at the trailhead. There was a fair amount of cars parked. 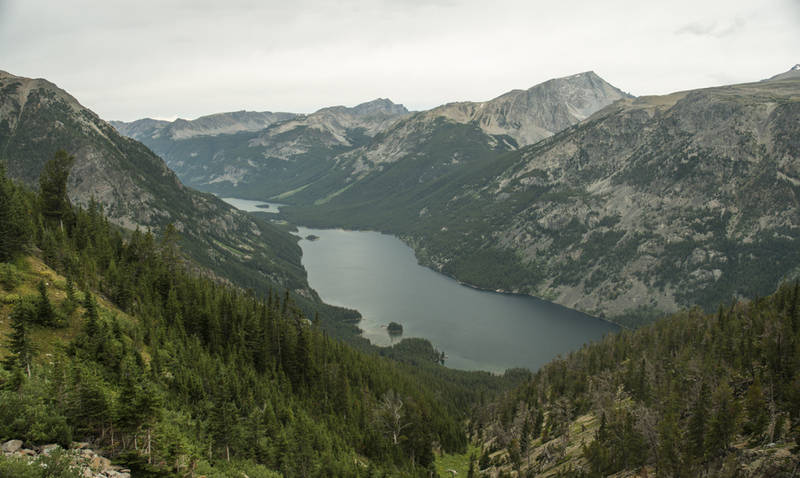 Due to the convention, the amount of highpointers heading to the summit was much higher than usual, plus Mystic Lake is a popular day hike in general. Luckily we all found spots. We met Cat, the other guide who would be leading us along with Nadav. We all got our gear together and were given our share of the group gear and food. My pack was a reasonable 33 lbs. I had trained for up to 50 lbs, so this was already a good start. Some gear was already up at the camps, which saved us a few pounds here and there. We made use of the last restroom we would see for several days and finally hit the trail. It had so far been a nice day. Partly cloudy to start, but those clouds became increasingly more gray the further we went. We made our way up the valley leading to Mystic Lake. Even surrounded by all that rugged nature, there were still signs of civilization, mostly in the form of the pipeline coming from the dam at Mystic Lake, which ran along the valley wall opposite us, and the odd pump house. Eventually we came up and over the dam at Mystic Lake. The view form the dam overlooking the lake is spectacular. Nestled in valley, the long narrow lake stretched out before us. A lot of day hikers were already there, hanging out on the dam and beaches on the south shore. We had no time for lounging about however, as we wanted to get up to first camp and get settled in before sunset. Taking a break on the switchbacks, with Mystic Lake in the background. 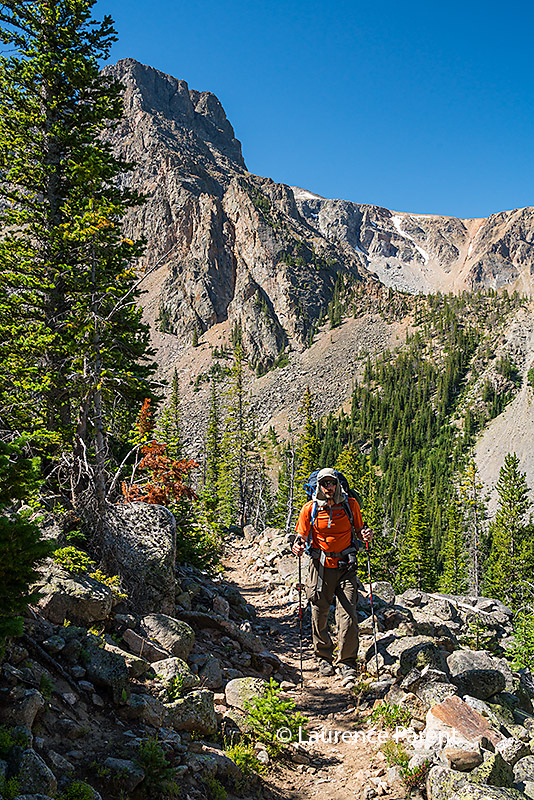 Once past Mystic Lake, we approached a well known part of the trail simply called the Switchbacks. There are over two dozen switchbacks from bottom to top. This section was the part I was most concerned about heading into the trip because it was so steep. It gains several thousand feet in less than a mile. As it turns out though, it was one of the easier parts of the hike precisely because there were so many switchbacks. The switchbacks add a lot of distance, but they also make it feel like a pleasant hike instead of a grueling climb. Not long after starting the switchbacks those gray clouds that had been gathering finally started raining. It wasn't bad, but everyone stopped to put on their rain gear. Inclement weather was to be expected, especially in the afternoons. Half way up the switchbacks we stopped for a break and to take off our rain gear as it had stopped. Shortly before we reached the top of the switchbacks the rain gear was back out and it was raining again. It was also starting to cool off considerably, so the layers were mostly staying on the the rest of the day. Eventually we made it to the top of the switchbacks and onto the ominously named Froze-to-Death Plateau. Thankfully it never lived up to it's name. From here it was still over a mile to the campsite. It was a relatively easy mile as the terrain was easy hiking with no trees and few rocks, and what little elevation gain there was was gentle and gradual. Once we reached the campsite everyone dropped their packs and took a well appreciated break. Once camp had had been set and all our stuff put away, we were free to just hang out and take in the beauty of the mountains. The camp site was only a couple hundred yards from the edge of the plateau so the views across the valley were spectacular. The overcast sky had started to break and the sun came back out just in time for evening magic hour. Clouds still hung over the plateau but the sun was shining brightly above the horizon which made for a stunning display as the clouds above us and the barren terrain around us was bathed in warm, orange light. Dinner time at first camp. With nature putting on a show, we gathered around the "kitchen" (a small windless depression near the tents) as the guides cooked up a delicious one pot meal that we all scarfed down while we talked about the day's hike and what to expect tomorrow. Once the sun set it started getting dark and cold quickly. I was glad for that extra layer! We cleaned up from dinner and got into our tents for the night. I was paired with Roger as a tent mate. He would also be my climbing partner on summit day. DAY ONE PHOTO GALLERY: Luckily, Laurence was also a photographer, so I had plenty of images of myself that weren't selfies. He was nice enough to let me use the images, so they're mixed in with mine (his contain his copyright stamp, and also have me in them). I was up with sun, as I usually am on vacation. Before breakfast I was wondering around camp when I noticed down by the edge of the plateau a pair of mountain goats. This was the first I'd seen them on the hike so far. I wanted to get a closer look, as seeing mega fauna like this in the wild can be rare and so I wanted to take advantage of the situation. I let the guides know where I was going and headed down to the edge. Up close and personal with some mountain goats. Aren't they adorable? In contrast to the dry, rocky terrain that covered most of the plateau, the stretch from camp to where the goats were was soft and grassy, dotted with small streams and deep puddles. All the water was from snow melt from the snowfields uphill from our camp. After a while of zigging, zagging, and hopping around water features, I got down near the edge of the plateau and in close proximity to the goats. They didn't seem too bothered by my presence. For a while we just stood there, maybe a dozen yards apart, checking each other out. They seemed just as curious as I was. 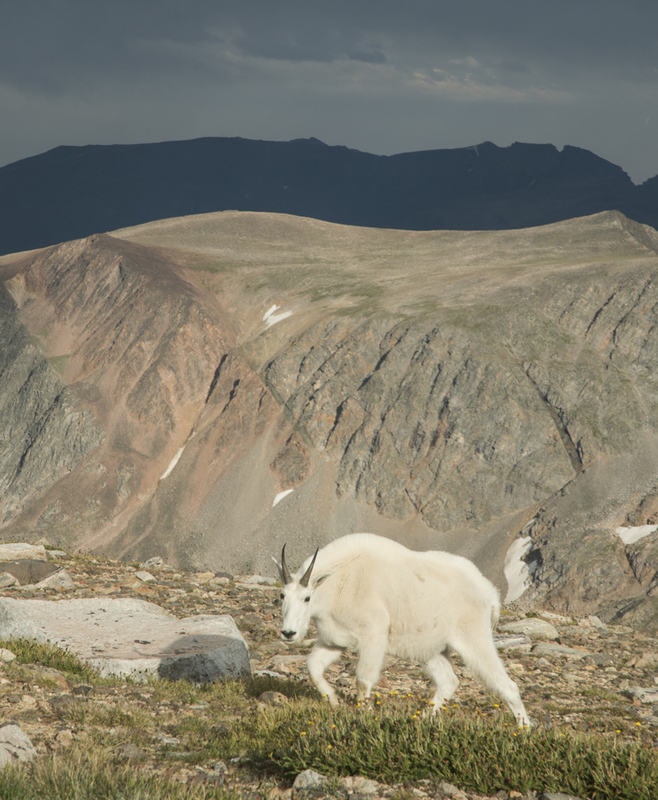 After spending some quality time with them I let them get back to the business of grazing, and I made my way back to camp, happy knowing that I got in my mountain goat sighting for the trip. When I got back to camp I told Nadav about my lucky encounter. He told me that the goats aren't all that rare and that we'd probably see more of them. He also told us that they have a taste for... human urine. Sure Nadav, whatever. I bet you tell that to all the newbies. Once breakfast was finished we packed up camp and off across the plateau. Today would be the "easiest" day of the trip. It was only about 2.5 miles to the next campsite with not much in the way of any major elevation gain. There really aren't any defined trails on the plateau, and the Granite Peak summit can't really be seen from the northern half of the plateau or used as a landmark until later, so orienteering is a very good skill to have up there. Of course we had guides who already knew where they were going so that made it a lot easier. 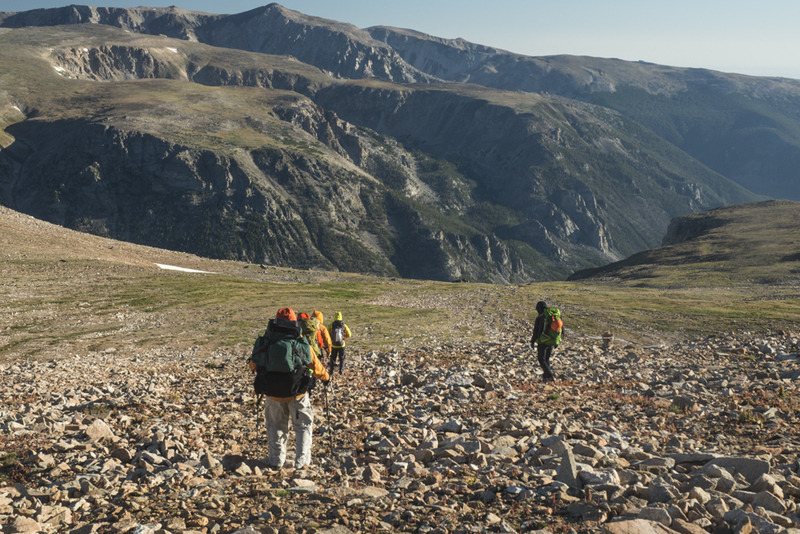 After leaving camp and getting onto the higher parts of the plateau the terrain became much more rocky, with seemingly never ending scree and talus fields. While not difficult per se, every step does take concentration and becomes mentally tiring after a while. There would occasionally be patches of grassy, relatively rock free ground which made for a welcome respite from the talus fields. Endless fields of talus of the way to high camp. The summit of Granite Peak can now be seen in the distance. About three quarters of the way through the day's hike we took a break. Nadav addressed the group about a few items. We needed to decide where we wanted to make camp. There was a choice of two designated areas. One would make for a longer summit day hike, but a shorter hike out on the last day. The other would be less distance to the summit but longer hike out. We opted for the closer site which had the shorter hike out on the last day. The other item was Nadav wanted to see how we were all doing and how we felt about the next day's summit bid. I was feeling great and was super confident about the technical climbing at the summit. I was a go. Most everyone else was also feeling good. Chris said he was opting not to go with us to the summit. He had some issues with the climbing session back in Cody and wasn't feeling really confident about how much technical stuff was going to be involved. He would be staying at camp while the rest of us attempted the summit. It's very important to know your limits, what you're comfortable with, and to know when not to risk something that you aren't sure about. We reached the high camp and set up the tents. This would be home for the next two nights. Not long after we set up camp, the goats showed up just like Nadav had predicted. This time there was about a half dozen of them. Never being intrusive, just kind of hanging out on the outskirts of camp. And when one of us would go outside of camp to take a piss, the goats would follow. When we were done and walked away, the goats moved in and started licking the pee off the rocks. I wouldn't have believed it if I hadn't seen it with my own two eyes. They do in fact have a taste for human urine. We figured it is probably due to the salt content, but still. Isn't nature amazing? View from high camp on the plateau. As entertaining as the goats were, I couldn't help but notice as the evening wore on that I was starting to feel not right. I had a mild headache and my stomach was slightly uneasy. It wasn't enough to put me down or anything, but I was worried about it being signs of altitude sickness. This was the highest I'd ever been for a sustained period and so wasn't sure how I would react. It was mild, but with the climb the next day I didn't want it getting any worse. I let Nadav and Cat know how I was feeling. They said to make sure I stay hydrated and make sure I ate dinner, since I would need the energy whether I climbed the next day or not. I was able to eat dinner, if not quite as much as I normally would've, and took it easy for the rest of the night. It was a bit cooler at high camp than it was the night before. Middle of August and I was wearing four layers. It actually was better than that oppressive heat from two days prior in Cody. We had a very early start the next day so we started packing it in to try to get a decent night's sleep. The amazing mountain view, and the ever present goats, would have to wait 'til tomorrow. There was climbing to get ready for. To say we got up at the crack of dawn would be misleading; it was way before that. It was still dark out when we all started spilling out of our tents. 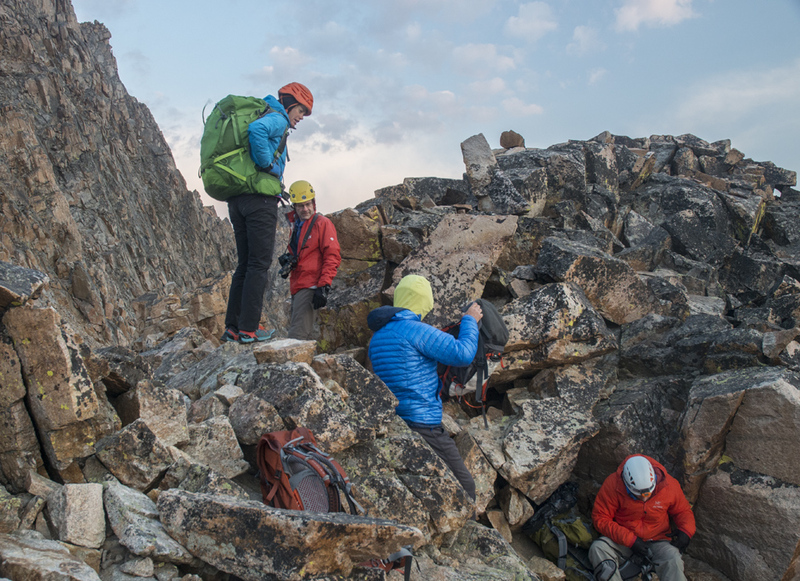 Once our summit bags were packed, it was a simple breakfast of bagels, tea, and oatmeal. Then we all geared up and set off across the plateau toward Granite Peak, which with any luck, we would be summiting by lunch time. Thankfully, I was feeling much better than the night before. The headache and queasiness were gone. I was feeling good and ready to get going. Chris saw us off and wished us luck. We headed off into the darkness with only our headlamps lighting the way. This first part of the hike from high camp to the saddle was fairly mundane. Since it was dark, there was nothing to look at except the person in front of you. It was simply one foot in front of the other, navigating the ever present scree fields. At the edge of the plateau we stopped for a short break. Al had fallen quite far behind, and even after our break he was still out of sight. It was decided to continue on. Al was with one of the porters who was trained and equipped to lead him up the technical part, so at least he wasn't alone. We later found out that he aborted his summit attempt before hitting the saddle. The hike from the edge of the plateau down to the saddle was a drop of about 700 feet. The slope wasn't to bad, but we would have no idea of how exposed this slope was until later when it was light out and we could actually see it. Checking out Granite Peak in the first light of morning from the saddle. When we reached the saddle we took another break. The saddle was the low point of a knife edged ridge connecting the plateau with the summit area. The first wisps of dawn were finally starting to break up the darkness and we were getting our first glimpses of the summit. It was still fairly dark, but we could see the summit looming ahead of us. Even with my camera, which is excellent in low light, it was still hard to get a decent picture of it. It honestly didn't look that far away (they never do). We were also starting to get a look at the slope we had just come off of. It looked way crazier now that we could see it than when we were on it. Our break at the saddle was long enough where once we started hiking again we no longer needed our headlamps, as the orange and red hues of sunrise were appearing over Tempest Peak. This portion of the hike, from the saddle to the summit preparation stop, was one of the sketchiest parts of not just summit day but of the entire trip. We had been dealing with scree and talus for much of the trip, but this section really brought it to a new level. The entire side of the slope was covered in loose rocks often two feet or more in diameter. There was no hiking on autopilot here. Every step had to be carefully measured. Those of us using trek poles not only had to worry about our feet, but we also had to consider where to place our poles with every step. There was almost no exposed solid ground anywhere on this section. Shortly after my rock surfing incident. You can still see the terror on my face. About halfway between the saddle and summit prep stop, I had the scariest moment of the whole trip. As I was moving from rock to rock, the next rock in front of me was large (about four feet in diameter), flat on top, and level. It looked stable, or at least I didn't have reason to think it was any more or less stable than any other rock I had stepped on thus far. I made the short hop to it and landed on it with both feet. As soon as I landed the entire rock started tilting and sliding downhill. The motion of it knocked me off my feet and I fell on top of it as it was sliding. My hands went behind me off the trailing edge of the rock. All I could do was look ahead of me at the 1,000 foot slope down to a small lake below. My immediate concern was that my hands would get crushed by smaller rocks following me. Luckily, the rock stopped sliding after only about six or eight feet, and the whole ride only lasted a few seconds, but it was honestly rather terrifying. Once it came to a stop I just sat there for a moment, trying not to think of how truly awful this could have turned out. Cat was behind me. She didn't witness the slide, but had heard it and saw me still lying on the rock. She made sure I was ok. I could see by the look on her face that what just happened was almost really bad. My heart pounding and adrenaline pumping, I got back up on my feet. I was physically shaking. After a while the adrenaline flushed out of my system and I started feeling normal again. Despite being one of the scarier moments of my life, it actually wan't the worst part of summit day, but more on that later. After my rock surfing incident, we kept drudging up the talus slope until we finally made it to the summit prep stop. This is the start of the technical climbing section and where the rock becomes nice and stable and doesn't move at all! We would take a break, have some food and water, and relax a little before getting into our harnesses and getting roped up. It was a nice little area; out of the wind, amazing views of the summit and surrounding mountains. I found a natural chaise lounge in the rock and vegged out for a bit. No hiking, no backpack, just soaking in the sun and munching on trail mix. Meanwhile, Cat and Nadav were going over their plan of attack for the summit climb. Weather was also a concern. There were some clouds in the distance that had the potential for not being good, but Nadav was confident that we would have plenty of time before any afternoon thunderstorms rolled in. With that, we started getting ready. We got into our harnesses and split into two rope teams. I was to be short roped to Roger with Nadav as the lead climber/belayer. The other team was Lawrence and Mark with Cat in the lead. Once we were all tied in we headed for the summit. The difference between what we had done up to this point and the relatively short distance we had left was stark. We had a quick descent from the prep area and then a short walk over a small saddle. This trail was on a shelf and plummeted down a very steep slope for thousands of feet. This is where the exposure really started to kick in and the importance of being roped in for protection was evident. Across the mini saddle, we finally started the technical climbing portion of the trip. This was what I had been training eight months for at the indoor wall and the rock crusher back in Syracuse. I wanted this climbing section to be easy so I could concentrate on just enjoying it. The training paid off since all the climbing felt fairly easy. This was good, since there were plenty of variables I hadn't trained for, such as climbing with a pack, in hiking boots, in the cold, at altitude, with exposure. Even with all those variables it was still fairly straightforward and an amazing experience. It took several pitches to get to the top. Each pitch followed the same basic procedure; Nadav would lead climb to the top of the pitch and set the belay, then Roger and I would climb up once Nadav had us securely on belay. Some of the pitches required using anchors, but most were short and easy enough where we didn't need them. Since this was a fairly popular route many of the pitches had webbing in place to set the belay to. SUMMIT CLIMB VIDEO: The following is from my helmet mounted GoPro of the final ascent up the technical portion of the summit climb. Climbing up a pitch. I'm in the brown and blue. We could usually see Cat's team behind us, although we would loose view of them occasionally. We would wait sometimes so the two teams wouldn't get separated. Since I was the last one on the rope, it was my job to take out the anchors that Nadav had set on a few pitches. We were working quite well together. And my helmet came in handy once. I had stood up into an overhanging rock and hit my head. Because of the helmet I didn't even feel it. I had trained for this at the indoor wall back home and had even recognized a few moves I had done there as i did them on this climb. None of the climbing seemed too difficult. If I had to rate it I'd say most of the pitches were between 5.5 and maybe 5.7. I won't get too detailed about this section, I'll let my video above do the talking. I think it could be easily climbed without ropes, but I wouldn't take the chance. We would later find out that some guy fell a few days prior and died from his injuries. While I am a strong climber, it's not worth the risk. After climbing for while, we finally made it to the top! This was it. All the planning, training, expense, effort, it all lead up to this moment. We were at the summit. The view was of course breathtaking. On the side of the summit facing the plateau was a vertigo inducing drop of at least 1,000 to 2,000 feet. We were all still roped in to Nadav and Cat as we made our way over to the summit rock. I was able to get my pictures for my panorama (you can view that at the top of the this post). We took a picture with the four of us posing on the summit. It really was a great feeling of accomplishment, but we couldn't dwell on it. As Laurence pointed out, we were only half way done. We still had to get back to camp. 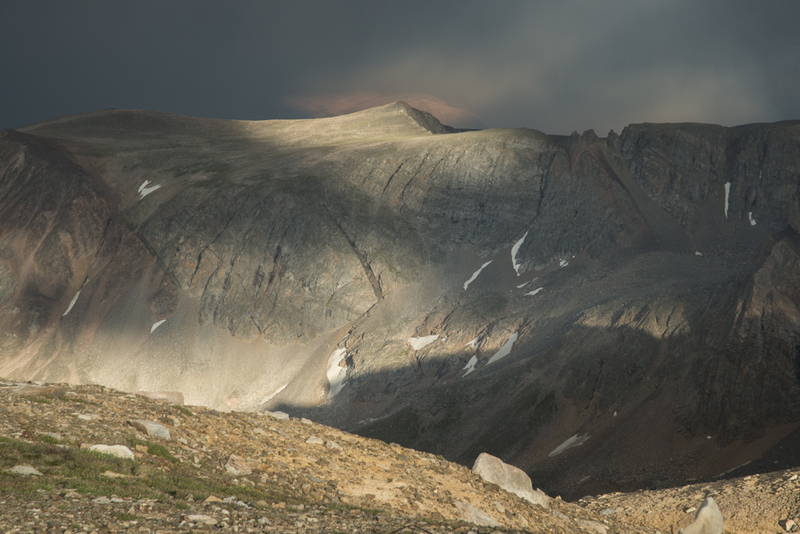 Big mountains like this are notorious for afternoon thunderstorms, and you don't want to be on an exposed summit when they hit. So after a short break to rest and get some food and drink, we geared up and started the process of down climbing. On the way up from high camp we had had the whole mountain to ourselves. We didn't see a single other person until we got to the summit, when we met some guys that had come from a different direction. On the way back we started seeing more and more groups heading up. Nadav and Cat commented on how many people there were. Because of the convention a lot of club members (including me and my climbing partners) had scheduled climbs for early in the week. We made it! Roger, myself, Laurence, and Mark on top of Montana. One group in particular stood out because they were a prime example of what not to do. Sometimes we would have to wait to go down a pitch because another group was coming up. No biggie, you just wait your turn. Well, we waited for the lead climber of one group to get to the top of the pitch so he could set his belay and start hauling up the rest of his team. We waited while he fumbled around with it. Eventually he asked Nadav if he could help. He obliged the man and helped him sort everything out. When he finished, Nadav turned to us and his expression said it all. That guy didn't know what he was doing. And he was the lead climber. This can be so dangerous. That top rope is a literal life line to everyone climbing up. It's sole purpose is to catch you if you slip and fall. If you don't know what your doing with it, someone could get seriously hurt or worse. This isn't the time or place to learn how to do it. What if Nadav hadn't been right there? If you don't know what you're doing, do what I did and hire someone that does. We eventually made it back to the summit prep area. We took another quick break to rest and get out of our climbing gear. Summit day was divided into two parts; the first part where I felt awesome, and the second part where I felt like crap. Thus began the second part of the day. Once we were packed up and ready to go, we started the hike back across the saddle and over to the plateau. This would again involve a down climb of about 700 feet before going 700 feet back up the other side. As we were heading down to the saddle I started to feel that same feelings as the night before, starting with the dull headache. I tried staying hydrated. I tried ignoring it. But it was always there, slightly distracting at first and gradually getting worse as the day wore on. As I've mentioned, hiking across talus takes all your concentration, and doing it with a nagging headache and a little jolt every time I stepped down to the next rock meant I couldn't rest my brain or get into a flow. By the time we got down to the saddle I was starting to feel fairly miserable, but I had to keep marching. The comfort of camp wasn't going to get any closer on it's own. 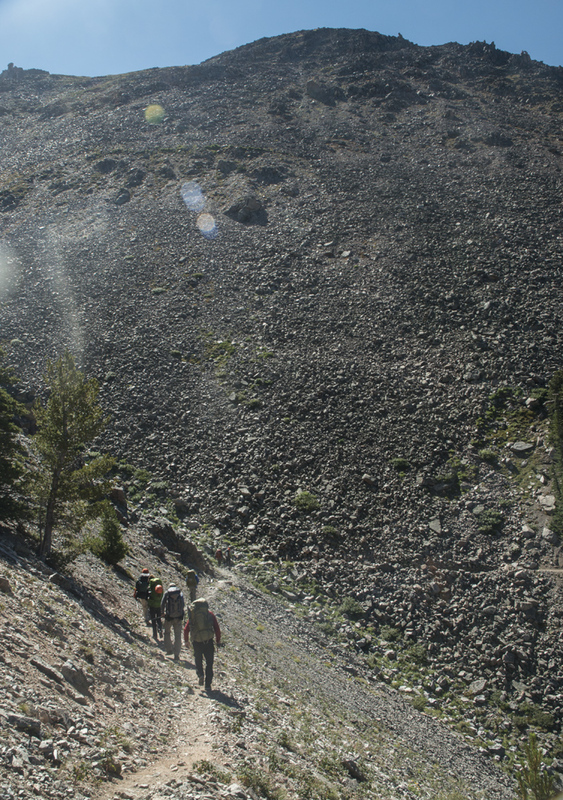 It was a 700 foot rise to get back on the plateau, but it felt like 7,000 as we traversed an angle on the talus covered slope. The one cool part about this section of the hike was that we now had a full daylight view of both the summit and the slope we came down from the plateau. It was pitch dark when we did it earlier, but now we could see the full magnitude of it. The slope looks pretty nuts when you can see it. I'm sure every experienced hiker is familiar with the idea of false summits, where you spot what looks like a summit but when you reach it you realize there was still a lot more mountain hiding behind it that you still have to go up. Well, the hike back up to the plateau was no different. I spotted a point that I thought was surely the edge of the plateau. Throwing one foot in front of the other, I drudged my way up the slope. My headache was really distracting now. I was taking frequent breaks, which felt good, but only prolonged the climb. I finally reached that point I had been eyeing and found that I was just a little over half way up. The plateau had taken a slight bend here and the rest of the trail had been hidden from view because of it. I just wanted off that damn slope! Working our way up the relentless, talus covered slope back up to the Froze-to-Death Plateau. As I got closer to camp the headache got worse and now the queasiness was kicking in big time. Even though I was now close enough to see the tents clearly, maybe a 1/3 of a mile away, I had to stop. My stomach was not feeling good at all. I bent over, leaning on my trek poles, and closed my eyes, trying to concentrate on making all this crap stop. It finally released and I threw up. It was mostly fluids. So much for staying hydrated. Mark was nearby and checked on me to make sure I was alright. Throwing up did make me feel a little better. The queasiness subsided, but I still had the headache. I mustered up the energy to finish the last little bit back to camp. Al, Chris, and the goats were there to welcome back the conquering heroes. Even though camp was only a couple tents surrounded by short rock walls in a barren landscape, it may as well have been a Club Med. Just knowing I was done for the day made me feel better. I checked in again with Nadav and Cat to let them know what had happened. They wanted me to try to get some dinner down so I had some energy, and of course to (re)hydrate. I managed dinner, took some meds, and took it easy. As afternoon turned into evening I felt much better. Nature's light show after a long summit day. While we never got hit by the bad weather that was threatening in the distance when we got to the summit prep area, some very gray clouds were now rolling in. Instead of a cold rain, however, we were treated to one the most amazing light shows I've ever seen in nature. The sun, which was now getting low in the sky, was shining through gaps in the clouds and throwing splotches of light on the mountains across from us. The patterns were always shifting and it just kept going for what seemed like an hour, until the sun finally set. And we even got a few snowflakes. We all just stood there watching in awe the whole time. It was really something special. The goats, however, didn't seem too fazed by it. A leisurely hike down the switchbacks. Waking up the next morning I felt so much better. Felt like I had energy again. And it was all literally down hill from here, so any adverse altitude effects should be behind me at this point. We broke down camp, packed up, had breakfast and got ready to hit the trail (or head in the general direction of where a trail would take us had there actually been one). I went to take one last pee before we got going, and of course I wasn't alone. Several goats had followed me and were quite anxious for a little sip. In fact, I had to re-aim in order to avoid peeing on the ringleader's head. Just a few days before I was thinking how lucky I was to have had an encounter with a pair of actual mountain goats. Now I was literally yelling at them to get away from me so I didn't pee on their heads. Certainly makes for interesting stories afterward. What we had done over two days on the way up we were now going to go down and be back in civilization in time for lunch. As we headed across the plateau we became spread out again. This was par for the course at this point. As long as we could see each other we were good, and on this flat, treeless landscape that wasn't hard to do. We got to the site of first camp, and it seemed a lot longer than two days ago we were there. It was still vacant. It also marked the end of the major talus fields and was much more grassy now. When we got to the edge of the plateau, at the top of the switchbacks, we all stopped and took a break to rest and get a bite. I took my shoes and socks off as I was starting to get a hot spot (pre-blister) on one of my toes. It wasn't bad and luckily it never developed into a blister. The switchbacks once again proved to be way easier than I had imagined. Going downhill isn't necessarily easier than going up, but the switchbacks were at just the right angle so I could really motor down them without my speed getting away from me. Laurence and I hiked together for a little while, stopping to take photos of each other as we came down the trail. That's what happens when two trained photographers get together. Once at the bottom of the switchbacks, we took another break near the shore of Mystic Lake. It was a really beautiful spot and I can see why so many people make the day hike up there. At this point, Al was starting to have some issues with his pack weight and asked if we would mind each taking a little bit of his stuff. So I took a few items to help out. Then we started the final march from Mystic Lake back to the trailhead. As great as hikes like this are, it always feels good to get back to the car. And actual restrooms. With no goats! It was just a pit toilet with no running water, but still. I weighed my backpack with my luggage scale and it turns out that with the camp gear and Al's stuff it came in at 34 lbs, one pound heavier than when I started. Figures. The adventure wasn't quite over yet, though. We all set off from the trailhead and were headed to a restaurant called the Grizzly Bar, in Roscoe, for one last group meal. Besides the post office, I think the Grizzly Bar was pretty much the only business in town. And it was amazing. I couldn't help but smile when I used the restroom and washed my hands in warm running water. And I ordered a big greasy burger and fries. While Nadav and Cat were excellent camp cooks, that burger was a little slice of heaven. We sat around the table trading stories of our adventures for a while. I could've stayed there all day, but I had to hit the road, as I had camping reservations at Theodore Roosevelt National Park in North Dakota that night, a five hour drive away. As I said goodbye to my fellow climbers (some of whom I would see in a few days at the convention) and our amazing guide team, I started to feel it. That little lump in my throat. The thought of what I had just accomplished was starting to set it. Even when we summited there wasn't really a lot of time to think about it, as we still had the long march back to the trailhead. So I got in my car, and set the GPS for Theodore Roosevelt NP. As I pulled away from the Grizzly Bar it really started to hit me; I did it. All those months of training and preparation had paid off. I made it to the top! By myself in the car I started saying it out loud, "I did it! ", over and over again. I started crying. I pulled over so I could compose myself for a minute. 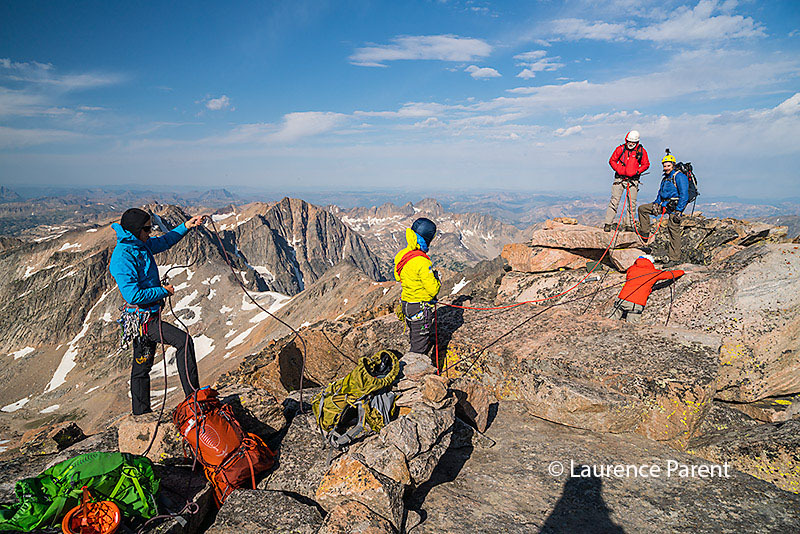 While everyone else in the party had several big peaks under their belt, this was my first real mountaineering trip. I felt a little silly, sitting there crying over climbing a mountain, but they were tears of joy for sure. After a few minutes I had calmed down, put the car back in drive, and continued on to my next adventure. Stupid goat! Get out of the way!